Dr. Steven Victor, CEO of Intellicell, seems to have made two comments on a recent blog post I did on stem cell sports medicine (see below). Victor and Intellicell received a warning letter from the FDA in March 2012 with the FDA. I’m not aware of Intellicell publicly addressing the FDA issues. If you have, Intellicell, please let me know. I have emailed Dr. Victor about the current state of affairs at Intellicell and I’ll let you know if he responds. Specifically, your processing alters the relevant characteristics of the adipose tissue relating to the tissue’s utility for reconstruction, repair, or replacement. Therefore the processing would not meet the definition of minimal manipulation for structural tissue such as adipose tissue. As a result, the IntelliCell product does not meet the criterion in 21 CFR 1271.10(a)(1). I would also take issue with the comment’s claim that the safety is 100%. There is no such thing. In the past, Victor had been given the nickname “Dr. LookGood” for reportedly improving the looks of celebrities. 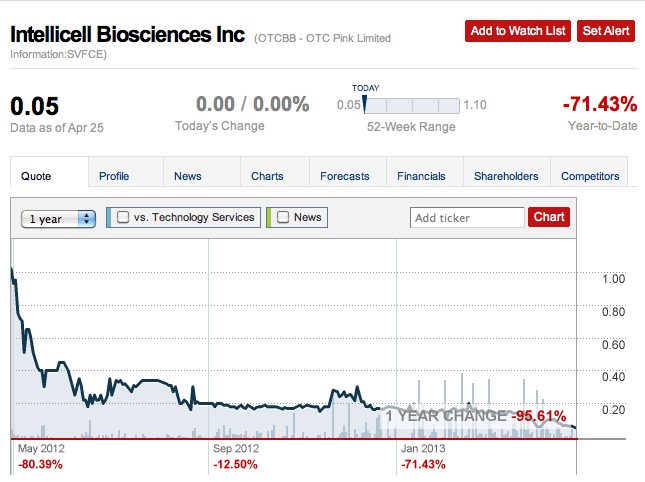 Intellicell stock is off almost 96% in the last 12 months and 70% in 2013 alone (see above). Will the company survive or end up in bankruptcy? Disclaimer: I am not a financial analyst and all financial decisions should be made with a certified planner or accountant. I do not own stock in this or any other stem cell-related company at this time. As far as financial we are raising money to grow and we are a young public company just beginning to grow. Dear Dr. Victor, What about the apparent multiple lawsuits facing Intellicell? What’s going on with those? Collagenase, an enzyme naturally found in the body, helps to break down fibrous tissue by dissolving collagen. Collagenases are produced by different cells involved in the wound-healing process, e.g. macrophages, fibroblasts and keratinocytes. Collagenase is well known for treatment of chronic dermal ulcers and severe skin burns (Collagenase Santyl® Ointment). Collagenase has been approved by the FDA for use in decreasing the scarring in Dupuytren’s contractures. Light, in particular LED, has detrimental effect on MSCs proliferation (http://adult-stem-cell-therapy.blogspot.com/2012/09/adipose-fat-stem-cell-counting-methods.html). It’s known from IVF laboratory practice that light contributes to the production of ROS (free radicals) and fluorescent light is avoided as a standard practice. Let’s forget for a minute that there is a lot of bogus science behind what Dr. Steven Victor from Intellicell claims. Let’s focus instead on how company money from a publicly traded company has been misapporpriated for personal use by Dr. Victor, he uses company money as his own personal piggy bank. Not the first time he has done this and probably not the last…. Do you have evidence to back up this accusation? Mr. Knoepfler, what do you thing about the Intellicell claim that viable regenerative cells can be separated with ultrasound and provide therapeutic benefits? Others in the field say it is not possible without ripping the cells apart. I personally have not found anyone not associated with the company who was a fan of the ultrasound method the way IntelliCell does it. I have communicated with several patients that had very favorable outcomes from treatments. The only ones rushing to define the removal of ones own cells and infusing them back intact as a drug are drug companies. Exception being maybe Roche who supply enzymes. Ask Joe public and the clamor is for more stem cell research. Take a poll, public wants and it it will come. Even if the drug companies bend the FDA’s ear, international research will just leave the USA in a 3rd world nation status when it comes to research and advances in this field. I am interested in a lot of biotech companies not only this one. A lot fall into the penny stock realm which is hard to escape because or relentless shorting of those stocks by stock manipulators. Not just biotechs but pennies as a whole. Getting back to Intellicell, in doing my DD I have found nothing but happy patients, and good feeling for the Doctor in spite of some reservations I have of him as a business man. As of late they seem to be aligning the stars sun and move to make a giant move. Hopefully a good one. They did have legal problems and that breeds vindictive parties carrying out all means of counter productive measures. Sounds like propaganda to me, Mac. There is a lot of propaganda out there. A lot of misinformation. # one propaganda is drug companies whining that stem cells or the retrieval process should make them a drug. An athlete punishes (manipulates) their body wrecks more havoc then the retrieval of stem cells. Are we next to claim tearing down ones body in a calculated attempt to rebuild or muscle cells into new bigger and stronger mass now be administered by the FDA. Is training illegal manipulation of ones cells in the FDA’s eyes. I just see the public not buying in. The process should be controlled to prevent infection, or mishandling, beyond that its an individuals right to weigh their own safety.